The cottage will be truly 'on the edge'. The lot is flat at the top but slopes a bit and then very sharply down to the lake. In fact the steps, already built, down to the lake number 104. So the cottage design we were looking had to fit that shape of the lot. We settled on a small one story cottage with a basement. The basement will, of course, because of the slope, be a walkout basement. In our mind's eye it fits perfectly! 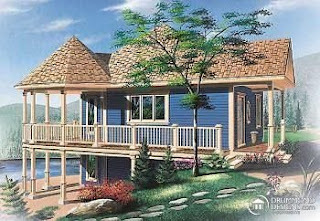 I purchased the plans online from Drummond Designs Inc. They can be found at www.drumonddesigns.com. The process went smoothly, and my plans arrived in no time via the post in a big shipping tube - I received 5 sets of plans. The only thing I might have done differently is opting for the electronic version. That way I could have popped the drawings directly into the CAD package I have... But then that is a subject for another time.